My main focus of research had always been on first-wave immigration. My great-grandparents immigrated to America in 1908 and 1914 from Trzcianiec in the Bircza district, Dobromyl povit of Galicia. As the news of the digitization of the International Tracing Services (ITS) holdings at Bad Arolsen, Germany become more prominent in Eastern European research circles, I decided to take a new approach. What about those family members who chose not to emigrate? What happed to them? As a third generation Ukrainian-American, I have very few pieces of family memorabilia that tie us to those members who descended from my great-grandparents' siblings. We know that my great-grandfather and his older sister chose to emigrate, but the remaining eleven siblings did not. My great-grandmother travelled with her older sister; however her sister chose not to stay in America and returned to Galicia before WWI. I enlisted the help of my cousin Andrew in Edmonton, Canada, a descendant of my great-grandfather's youngest brother, to reconstruct our Szymanówka (Шиманівка) family. Our first step was to cull the family stories for key events from WWI through post-WWII. We were able to compile a rudimentary list for each child: possibly dead before 1945, taken to Siberia, deported in Akcja Wisła, or forced labor in Germany. As an added research bonus, I knew that my husband's grandparents were Ostarbeiters who emigrated in 1951 from Germany. With my family list and my father-in-law's interview notes, I felt that I had enough information to use the ITS collection. 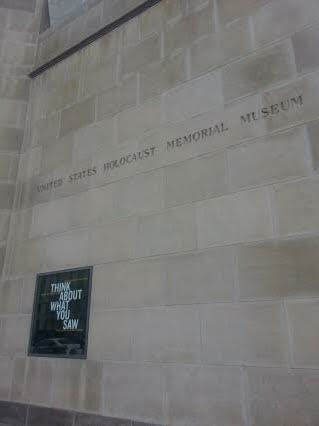 My first visit to the museum was in December 2013 with my mother. This visit was planned to use the Resource Center and Library to determine what records, resources, books, and more that could possibly assist in our research. After a quick ride on the Metro and a short walk, we arrived at the Museum just prior to opening. The entrance line was already queued, but we were told it moves quickly. As with all Smithsonian facilities, everyone is screened through security. The Resource Center is located on the second floor of the museum and actually acts as the last room or exit of the prescribed tour path. There we met staff who were extremely helpful and set us on our path of discovery. The center has five computers that allow patrons to access the ITS collections via two main indexes: Central Names Index and Displaced Person Card index. Also, the portal provides easy access to record collections of much broader scope, such as reports from the Allied Expeditionary Forces (A.E.F.). 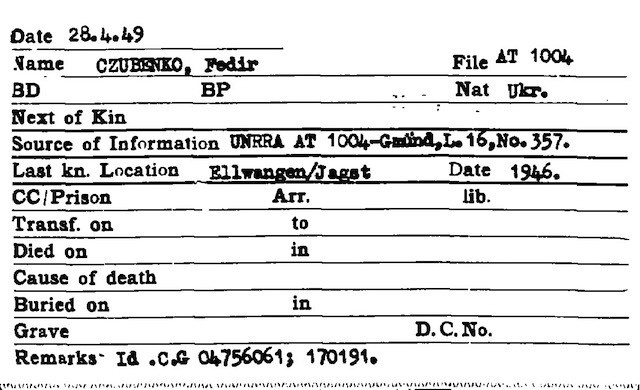 Among these reports, I found a 1947 list of Displaced Persons camps located in Germany, Italy, Austria and other locations. Since that first visit, I have returned two more times to spend 25+ hours of research using the ITS collection along with the microfilm of selected archival material from regional Ukrainian State Archives in the USHMM Library. Unfortunately my results were not very fruitful for my Szymanówka (Шиманівка) family: I could only locate the marriage of a cousin who was a forced laborer in Germany. But I know this may change as more records are digitized and added to the complete collection. My success was achieved with the searches for my husband's grandparents. I was able to obtain their DP Registration Cards, my father-in-law's Geburtsurkunde (birth registration), the typescript copy of their June 1951 ship's manifest and other documents that help me reconstruct their time in the displaced persons camps prior to their immigration. 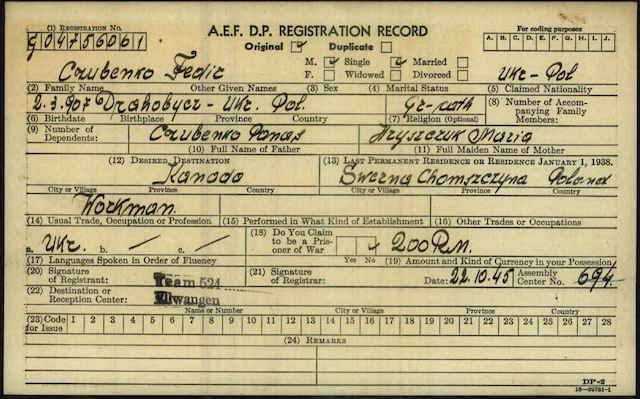 Beyond the Displaced Persons, Ostarbeiters and AEF records, the hidden gem within the Central Names Index are those inquiries from family searching for missing relatives after WWII. From this collection, I was able to find records of a daughter who was placed in a Polish orphanage and later sought the location of her mother who immigrated to Australia. So, if you're thinking that it might not be worth your effort to use this collection, I would encourage you to 'check out' the resources. One might never know the hidden gem that may be waiting for you. Many first-wave researchers may not think to come forward with the ancestral lines, but I want to share with you that genealogy is gaining popularity in Poland, Ukraine, Romania, Slovakia, and Hungary. Your cousins are out there and today, they might be just one click away. A self-proclaimed southern belle born north of the Mason-Dixon Line, she is a professional genealogist with deep ancestral roots in colonial America from her father and 20th century flair of Eastern European ancestry (Ukrainian and Hungarian) from her mother. Michelle is a founding member with the Family History Group – Nashi Predky – at the Ukrainian Historical and Educational Center of New Jersey.